Over the past several years I have had the honor of volunteering at the Los Angeles Mission. During these visits, I have served dinner at a graduation celebration, answered phones, welcomed visitors and those in need at the front desk, and packed Easter baskets for the huge annual Easter event. On each of these occasions, I was increasingly impressed by LA Mission, the generous people who give of their time, heart and soul to work there, and to come volunteer there, and most of all the people who come to LA Mission for help and a new start. The pride and renewed dignity was beaming from the rehab & training program graduates ...and their families! I had never served so many people (over 250), at such a fast pace, multiple courses. The 2 hours flew by in a blur of wait staff, dinners, and pitchers of punch. What stands out in my mind from that night, and stays with me as an inspiration always, is GRATITUDE. The gratitude of the graduates and their families - grateful for this new beginning, grateful for the help they received as they learned new life and career skills, fought addiction, and regained their inner balance and strength. Gratitude from the LA Mission staff for the extra helping hands of the volunteers. Gratitude of staff and volunteers for having the opportunity and honor to be celebrating with these brave people, who took back control of their lives. It was an exquisite evening. Working at the front desk was not merely clerical work. People came in to sign up for various services....emergency food baskets, a shower, dinner. The homeless mothers who came in with their babies in their arms, requesting diapers, affected me in ways I am not sure I can even adequately articulate. Things we take for granted as being just a normal part of life are so desperately needed by so many - way too many. As we complain about the expense of diapers or contemplate between disposable and cloth....we don't think about diapers and wipes as luxury items. Can you imagine holding your child, knowing your infant desperately needs a clean diaper, and having no way in sight to get these basic necessary items?!?! Parents in need are given a 5 pack of diapers and wipes. The relief and gratitude on the parents' faces was heart wrenching and beautiful at the same time. My favorite volunteer time was early one Saturday morning, packing Easter baskets. I brought my 3 children with me to volunteer. I had always planned to share this life changing experience with my children, and was glad of an appropriate opportunity to do so. Side by side, joined by volunteers, Mission employees, and program residents, as well as a father-daughter team, and a Girls Scout troop, we filled colorful plastic eggs with candy, filled baskets with toys, candy, stickers, and more fun items. With every item prepared I could just imagine the excitement and joy these baskets would be bringing to children on Easter. They could celebrate the holiday despite their circumstances, and would have fun treats to brighten their day. It was SO wonderful to watch my children enjoy the same volunteer experience. As a family....we were helping other families. Nothing feels better than that! We rarely realize how much we have. No matter how small our residence may feel, we have a roof over our heads. Think of that with gratitude.... especially when it rains! We have food, we are not starving, nor are we watching our children starve. Not all are so fortunate. We often drag through our days, feeling worn out and like we should give up on our dreams....There are SO many who EVERY day wake up on the streets and find the strength, the faith, the hope to get through another day, and take another step towards rebuilding their lives. We have SO much!! The least we can do is share. Times are hard...and just because some have less than us, does not mean we have even a dollar to spare. Many people, in this economy are just a hairbreadth away from being homeless themselves. Yet we ALL have something we can give. We can give of our time; We can lend a hand; We can smile as we serve someone what may be their only meal of the day; We can donate the clothing that we haven't worn in months (or longer) and give someone else a refreshed feeling of identity and self worth. The people that I met...gave ME so much....They reminded me what strength truly looks like; How indomitable the human spirit truly can be; How grateful and giving so many truly are. PLEASE volunteer....there are many opportunities in EVERY area, no matter where you live, and of course you can send donations to organizations worldwide. I encourage you all to visit the LA Mission website for more information on the many services they provide and how you can help. The Los Angeles Mission is a nonprofit organization serving the homeless living on the streets of downtown’s Skid Row. Faithfully, for 75 years, they have saved many lives and have had a profound impact on thousands of others by providing compassionate, humanitarian services to those in desperate need. Homeless people today struggle with more debilitating habits than just alcoholism. Drugs play a large part in street homelessness. Crack cocaine is the preferred drug for most homeless drug addicts, but there is no shortage of choices. Other drugs also devastate and kill. Physical and emotional abuse produces a climate of fear while many fall prey to their own imprudent sexual practices and still others – especially women – are victims of sexual, physical and emotional abuse or abandonment. Issues surrounding education, employment, healthcare and affordable housing continue to plague those in our community. 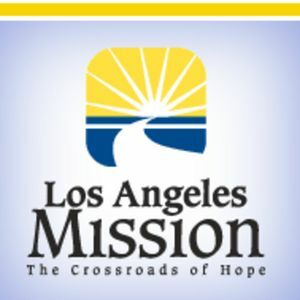 The Los Angeles Mission strives to reach out to every individual,offering help & hope as they face their unique needs. The typical homeless person in Skid Row is no longer a white, male alcoholic. Turns in the economy, unemployment, housing prices, the pervasiveness and easy accessibility of street drugs and other factors have changed that. Today, the Los Angeles Mission serves a diverse population. On any given day, a drive through this area would reflect a population of 55% African-Americans, 28% Hispanic Americans, 14% Caucasians, 3% Asian Americans/others. In 2005, 87% of the Missions' outreach population was male, with an average age of 35-44. The numbers of homeless women and children are growing rapidly. Today, 13% of the population we currently serve is women. Please visit the Los Angeles Mission website for the full details on their many services including Emergency Services, Recovery Services, Transitional Services, Holidays and Special Events...AND volunteer opportunities!